Ontario, for example, blamed “severe supply shortages across the country” for its curtailed approach to cannabis retail expansion. Cannabis NB, the only legal retailer of adult-use cannabis in New Brunswick, last week cited a “national supply shortage” as its biggest challenge. New Health Canada data paints a more complete picture of the cannabis shortage cited by such provinces. Cannabis that is “packaged, labeled and ready for sale” – called “finished inventory” by the federal regulator – far outstripped actual sales in the first two months of legalization, according to data released by Health Canada this week. While provincial wholesalers cited shortages in December, “dried” cannabis held in stock by cultivators, processors, wholesalers and retailers that month outstripped actual sales by a ratio of 3-to-1. Just over 7,000 kilograms (15,432 pounds) of medical and adult-use dried cannabis was sold to consumers in December compared with the 19,000 kilograms that were “ready for sale” in warehouses across the country, according to Health Canada. 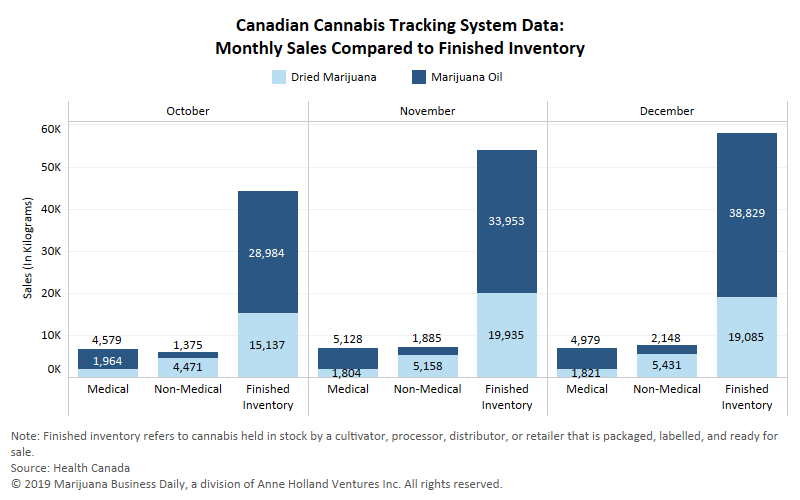 Also in December, cannabis oil held in stock by cultivators, processors, wholesalers and retailers that was “ready for sale” outstripped actual sales 5-to-1. As the list of cultivation applicants continues to grow, Health Canada has faced criticism that it is not issuing licenses fast enough. As of Dec. 31, 2018, almost 840 site applications were in the licensing pipeline, Health Canada told MJBizDaily. However, more than half of those had failed to transition to the new licensing system as of the end of 2018, meaning their applications were effectively in regulatory limbo and not being scrutinized. Questions over quality and demand for certain products are also contributing to the apparent shortages. Dan Sutton, CEO of British Columbia-based Tantalus Labs, suggested quality could be a concern for consumers. The Nova Scotia Liquor Corp. – which oversees cannabis sales in the province – said customers are looking for particular products, causing shortages of some items. “Our customers are looking for particular product pack sizes and THC/CBD levels, and those are the areas in which we are experiencing shortages,” spokeswoman Beverley Ware said. “For example, there is great demand for smaller package sizes of high-THC dried flower.